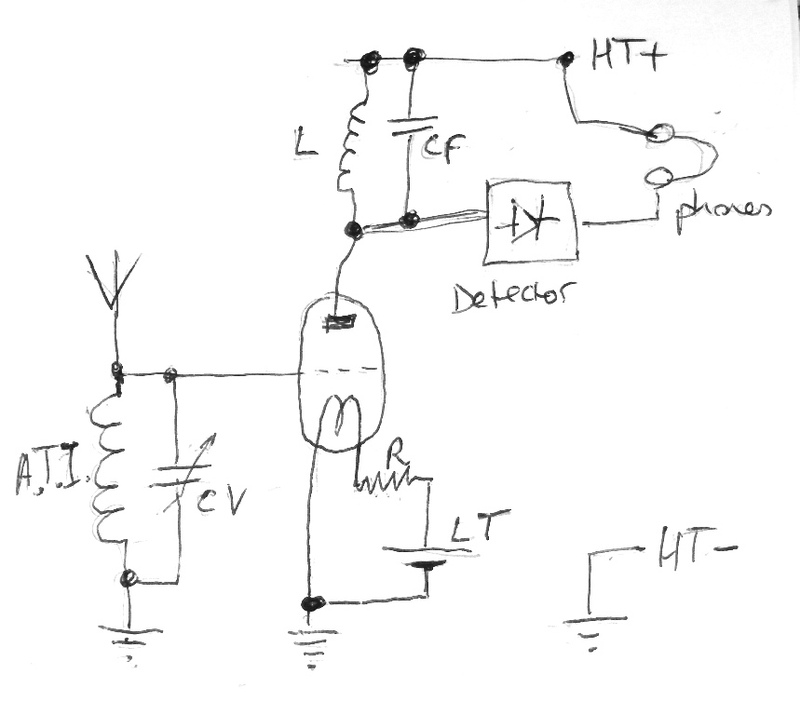 Today's radio cutting describes how to add a thermionic valve (tube) to a crystal set as a radio frequency amplifier. I think ATI stands for Aerial Tuning Inductor, and together with the variable capacitor (condensor) which is mentioned, these provide the means of tuning the modified set. (Some values for these components might have been useful!) I assume that a triode valve, with a filament is envisaged (we are talking 1920's - so indirectly heated cathodes were not in use). Again no type number or Voltages for the HT (High Tension) or heater (Low Tension) batteries are given. It also troubles me that the crystal set is connected into the anode, or plate circuit of the valve - directly connected to the high tension terminal of battery, which might be, say 120 Volts. This could have been an electrifying experience for the listener wearing the headphones if they had come into contact with the terminals or uninsulated wires attached to the 'phones. An inventive person, with a good understanding of electronics might have made this work, but they probably wouldn't have needed the wordy description in the "Wireless Hints" column!